Home@MACLEAYCOLLEGEEditorialBrave? Stupid? Or ‘just footy’? August 20 James Hearnes Editorial, SPORT Comments Off on Brave? Stupid? Or ‘just footy’? Hatch’s James Hearnes in a hospital bed as his mother looks on. It comes in bits and pieces, memory lapses between moments of violently being ill in the clubroom toilets, or waltzing dazed to the massage table and collapsing. I remember the paramedics arriving, cutting off my new jacket as they hooked me up to an IV drip, and enquired about just how far the closest Ambulance helicopter was from our location. Forty minutes earlier, I had been wrapped up in a tackle, my arms pinned before my head struck the firm ground. Initially, I had thought I was fine. Or rather I tried to convince myself that I was fine. Dizzy, but with otherwise no symptoms, I made my way to the bench. I had been concussed before, and this didn’t feel like that. Or, at least, not yet. Within 30 minutes, I had taken a turn. The splitting headache arrived, the dizziness worsened, I began to vomit and had a fit. Teammates would later tell me I looked ‘terrible’ and ‘like a ghost’. Paramedics arrived and, concerned with my symptoms on top of the neck pain I was experiencing, attempted to call for me to airlift me to the Royal Melbourne Hospital. The helicopter was too far away, but I was not getting any better. The ambulance would have to suffice. Strapped to a stretcher, I watched through my dizziness as my teammates gathered to see me being wheeled away, concern on their faces. Or, on the faces of some, worse than just concern. On July 22, AFL footballer Koby Stevens, then of St Kilda, announced his immediate retirement to the footy world. Just 27 years of age, Stevens joined names such as fellow St. Kilda utility Sean Dempster, Melbourne defender Heritier Lumumba, and Brisbane Lions youngster Justin Clarke in retiring from AFL football due to concussion related issues. Clarke’s retirement in 2016 particularly sent shockwaves around the AFL community, with the South Australia–born defender forced into retirement at the young age of 22. Clarke’s tragically premature retirement followed an accidental collision during pre-season training in January 2016, which saw his head collide with the oncoming knee of a teammate. A year later, Clarke made an appearance on the SBS program Insight, to speak about his life after football and his premature retirement from the sport. Stevens had managed to make it a little bit further in his AFL career, playing 91 games with West Coast, the Western Bulldogs and St Kilda in nine seasons at the highest level. Nonetheless, a concussion suffered in round one of the 2018 season would set Stevens on a collision course with an abrupt retirement. Stevens appeared on Fox Footy program On the Mark in May 2018 to describe his ongoing battle with his concussion symptoms. The spate of concussion related retirements in the last five years follows an AFL-wide rise in head-related injuries, with a 2017 AFL Injury Survey showing that the number of games lost to head or neck injuries, including concussions, had risen from as low as 2.8 per AFL club in 2014, to 6.5 in 2016 and 2017. Concussions, particularly, were responsible for an average of 1.6 games lost per AFL club in 2014 and were shown to have risen to 4.2 in 2017, after a spike of 5.6 the previous year. Coincidentally, the rising occurrences of games lost to concussion coincided with the AFL careers of Angus Brayshaw, of the Melbourne Demons, and St. Kilda forward Paddy McCartin. Since their debuts, concussion has been a recurring obstacle for both McCartin and Brayshaw, taken pick one and pick three in 2014 AFL Draft respectively. McCartin has managed only 34 games across his four seasons of AFL football, but has endured a staggering seven concussions. Brayshaw took a short break from the game in May 2017, after suffering his fourth concussion in only 12 months. In their returns to football since, both players have worn helmets in an attempt to protect themselves from further head injury and in an effort to prolong their footballing careers. This is despite there being no definitive scientific evidence that helmets available to AFL players provide any way to further avoid concussion or other such head trauma. Even with the tragedy of repeat concussions and related premature retirements, the AFL still admits to a distinct lack of understanding regarding the long term impact of repeat concussions, and appropriate preventive measures. Despite all the discussions, concussions and early retirements, the league’s chief medical officer, Peter Harcourt, told the Age in 2017 the AFL continues to search for answers. With access to state-of-the-art resources, the fact that a behemoth sports empire such as the AFL continues to lack sufficient information on concussion management and prevention leaves little hope for the understanding of footballers at a local level. Still, while concussion in football may not be going anywhere quickly, neither is Australia’s love for the game. 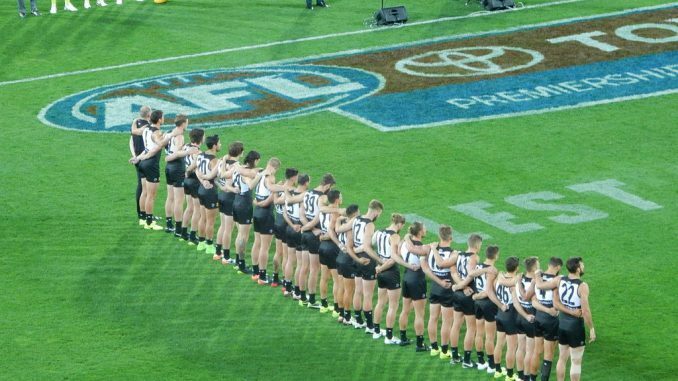 Indeed, the AFL celebrated the number of club members exceeding one million for the first time in the league’s history as recently as August 1. Away from the main stage, the number of registered participants playing the sport at local levels across Australia is thought to also exceed the same one million mark. Still, with so much attention on the AFL and Aussie Rules football around the nation, concussion remains as poorly understood as ever. Two months after his interview with On the Mark, Koby Stevens announced his retirement. As the news emerged on social media and across various local news outlets, I had just returned home from my stay at the Royal Melbourne Hospital following a football related concussion of my own. Having played club football since the age of 12, this was not my first experience with concussion. Growing up in the West Gippsland town of Drouin, football quickly became a significant part of my life. After all, Drouin had been the home town of football giant Gary Ablett Snr, in addition to current Carlton star Dale Thomas. Football, you could say, was in the blood. Like all who play the game, I have faced varying bumps, bruises and knocks. I have football to thank for a broken wrist, broken nose, broken cheekbone, multiple broken fingers, a dislocated shoulder and various soft tissue injuries. Yet, still, none of the above had ever ended with me in the back of an ambulance. Out of the ambulance and into emergency, ‘spinal precautions’ came next, including including a period of 14 hours forced to lie completely still, on a bed, in a neck brace. The hours spent staring up at the hospital ceiling provided plenty of time to think and wonder if I’d ever play the game I loved again. To outsiders, the answer would be obvious. Why would you risk long term damage or another concussion by returning? Now I had even more reasons to consider not returning to football, beyond the potential dangers to myself and my health. I had the terror in the eyes of my loved ones, as they stood over my hospital bed, to remind me to consider that I was not the only one impacted by these knocks. This is not even to mention the look of horror from my teammates as they watched me vomiting and having a fit in the clubrooms while paramedics hovered over me. All things considered, why would I return? Would I be compelled by some misguided attempt at bravery? Would it be stupidity? Or, whether at club level or AFL, is it all ‘just footy’? A part of the game? And, if it is ‘just footy’, what does that mean? The week after my concussion and hospital stay, I returned to the football field. Not to play, but to show my support for my teammates, and let them see that I was okay. I was quickly embraced with open arms, hugs were had, handshakes dished out, and well wishes for my quick recovery, even from members of the club’s supporters group that I had never previously known. For a young man having long dealt with low self-esteem and low self-worth, my return to the football club was like stepping into a different world, one where I felt accepted and felt loved. But, of course, this wasn’t a different world. Yet, this wasn’t a different world, this was ‘just footy’. Another week passed and again I returned to the field, still unable to return to the playing lineup but nonetheless actively involved by running water to teammates and offering advice from the boundary. My heart raced as the team began to get on top of its opposition – the same opposition who had beaten them by 75 points only two months previous. I willed my teammates on, revved them up, and supported them. I watched jubilantly as they ran home to win by 59 points and complete an extraordinary 134 point turn around. Again, I embraced my teammates, filled with emotion. I walked with them side by side back to the clubrooms and joined in as they sang the team song. And I realised this was why I wanted return. This was why I would stare down the risks and face them. Not for my teammates, but for my brothers. It’s more than ‘just footy’.